This is Pointe's August/September 2018 Cover Story. You can subscribe to the magazine here, or click here to purchase this issue. On a slushy March morning in New York City, Tulsa Ballet's Jennifer Grace took warm-up class onstage at The Joyce Theater, gearing up for the company's second day on tour. Even in a relaxed atmosphere, Grace epitomizes her name. In adagio, her arms move as if through warmed honey, swaying richly though never late. As she piqués into an attitude pirouette, her leg soars high, scooping air like a wing. Grace feels quite at home in roles like Cinderella's Fairy Godmother; Glinda, in Edwaard Liang's Dorothy and the Prince of Oz; and the Lilac Fairy, in The Sleeping Beauty. "I fairy-godmother a lot," she jokes. It's no wonder. Her stature (at 5' 5", she's one of the tallest women in the company) and singing movement quality cast a commanding aura. "Honestly, it's one of my favorite things," she says of dancing regal, feminine roles. "I get to move scenery around and make love stories come true." At 22, Grace is a recently promoted soloist, but she had an early chance to prove her authoritative stage presence. She joined Tulsa Ballet II at 17 and, while still in the second company, performed her first principal role: Titania, in Christopher Wheeldon's A Midsummer Night's Dream. Since then, Grace has had three promotions in four years. With more rungs to climb and artistic challenges still ahead of her, Oklahoma audiences have a lot to look forward to from this lissome beauty. Grace as the regal Queen of the Dryads in "Don Quixote." Photo Courtesy Tulsa Ballet. Grace's journey to Tulsa Ballet was far from easy, with long stints away from home and run-ins with bullies. She grew up in Bozeman, Montana, training at The Dance Center, one of the few studios in the area. Her mother, an early childhood education teacher, and her father, an IT specialist, supported Grace's training—no matter where it took her. 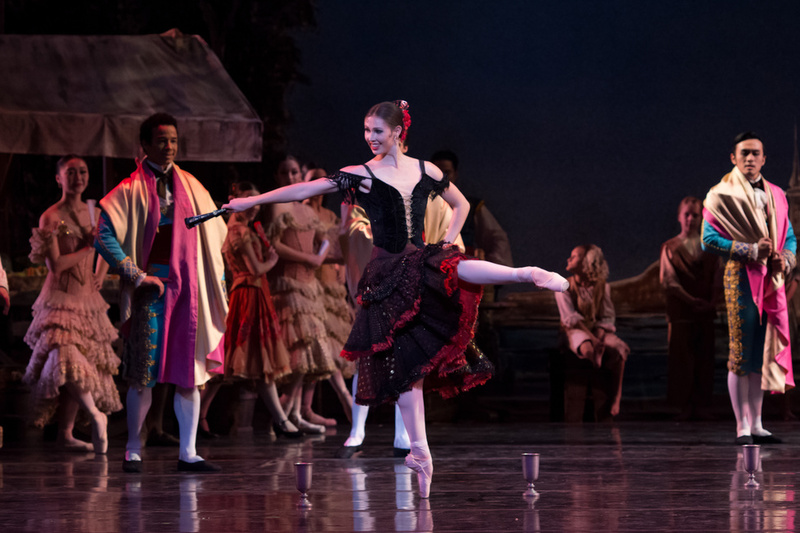 At 13, she attended the Bolshoi Ballet Academy's summer intensive in Connecticut and was invited to attend the year-round program in Russia. Excited for such a prestigious training opportunity, Grace headed to the Bolshoi that fall, her mother accompanying her for a short time to help her settle in. Surprisingly, it wasn't the urban life or the Bolshoi Academy's reputation for strictness that served as her greatest challenges. In the early days of the Bolshoi's international program, foreign and Russian students were mixed in dorms and classes. Grace says that because the school was trying to develop a good relationship with Americans, teachers were far nicer to her than they were to the Russian students. "If I was doing something wrong, the teacher would ask me to change it instead of just whacking my foot or poking me until I got my leg higher." She was also singled out by her peers for being placed in a class two years above her age group. Bullies looked for opportunities to get Grace expelled. For instance, the academy has a no-smoking policy; other students would place their cigarettes on Grace's bed and tell a house mother that she had been smoking. Although the plots weren't successful, Grace spent only six months in Moscow. She went home to Montana for winter break but had scheduling issues booking her return trip. "No configuration of flights could get me back to Russia because I was traveling as an unaccompanied minor," she explains. "We took it as a sign that we should find training closer to home." They selected the Dmitri Kulev Classical Ballet Academy in Southern California. Grace lived in an apartment with her mother most of the time, and stayed with her older brother's family when her mother would go back to Montana to spend time with her father. Grace found her new situation far easier than her experience in Russia. "One time zone away is better than 11," she quips. Serendipity dictated Grace's move to Tulsa Ballet. At 16, she competed in the Youth America Grand Prix finals in New York City but wasn't yet old enough to participate in the job fair. She happened to be at the studios on the day of the professional audition class, looking for a pair of misplaced pointe shoes. Without makeup, hair pins or dance clothes, she ran into YAGP's director, Larissa Saveliev, who ushered her into the job fair's technique-class component despite the age restriction. With artistic directors watching, Grace took class in dancewear borrowed from a generous participant and too-big slippers from the lost and found. Despite her frazzled start, Grace caught Tulsa Ballet assistant artistic director Daniela Buson's eye. "It's the way she covers space, the way she moves and a lightness in her dancing," Buson recalls. She took a cell-phone video of Grace's grand allégro and sent it to artistic director Marcello Angelini, who—despite not having seen her pointework—immediately agreed to offer Grace a second-company contract. Photographed for Pointe by Jayme Thornton. After turning 17 and finishing her degree through a hybrid online high school that allowed her to graduate in three years, Grace headed to Tulsa. Her mother stayed with her for six months so that she could get her driver's license. It's a reminder of just how young Grace was when she was cast as Titania. Despite her age, she didn't succumb to nerves or feelings of inadequacy. She attributes this in part to her co-workers' support and also to her faith: "It was one of those nights I could feel God working through me. The nerves just left." 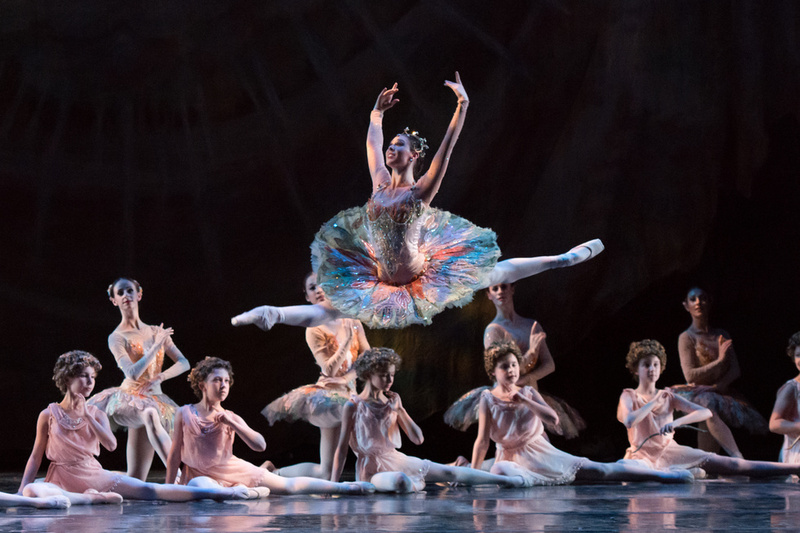 At the end of the Midsummer run in 2014, Angelini and Buson came onstage to announce Grace's promotion to the main company—after just four months in TBII. And the opportunities kept coming. Even before her 2015 promotion to demi-soloist, Grace did quite a bit of "fairy-godmothering," as well as originating roles in Adam Hougland's Cripple and the Starfish and Ashley Page's The Grammar of Ornament. The artistic staff show a clear investment in Grace's future, but note that she still has artistic and physical challenges to overcome. Or, for resident choreographer Ma Cong, her obstacles are more like depths to plumb. "When it's a raw diamond," he says, "you have to dig to it. When I work with her, I try to help her dig into her talent further." Grace performing the role of Mercedes in "Don Quixote." Photo Courtesy Tulsa Ballet. In March, Buson was coaching Grace on a barefoot role in Nacho Duato's Rassemblement. "It's very grounded and there's a lot of attack in it," she explains. "It was hard for her in the beginning because she's very pretty. Unless she takes it physically 100 percent, it doesn't read." For Grace, who had never danced barefoot before, the piece was a welcome opportunity for artistic growth: "Beyond the movement itself, you need to be able to show your need for freedom, or a scream of pain for your past." Grace and her frequent partner, demi-soloist Joshua Stayton, are repeated muses for Cong and other choreographers, but they have yet to tackle some of the ballet canon's most mature acting roles. (Onegin is at the top of both of their wish lists.) To be a convincing tortured heroine, however, Grace will have to access a certain vulnerability and darkness, one that doesn't seem readily available to such a sunny, charming dancer. Indeed, Grace's life outside the studio is better material for happy love stories. In July she married César Tavard, whom she had met at a salsa dance social on his first day in Tulsa. Although he travels quite a bit for his biomedical job, Grace says he hasn't missed a single show. The couple recently bought a house that they're remodeling together. "We're working under the assumption that I'll be staying," she says of living in Tulsa. Still, the self-proclaimed "country girl" dreams of far-off retirement plans in Montana, and she teaches at her home studio when she visits Bozeman. Grace isn't in any rush to go to college, but she would love to someday pursue a degree that blends dance and psychology. For now, she finds that Tulsa's flourishing arts community and the opportunities it affords are enough. "You wouldn't expect it in Oklahoma, of all places," she says. "I'm very happy where I am right now in Tulsa."